Floral Artistry By Alison Ellis | » When should you book your wedding florist? I love a good wedding magazine and they always come with a wedding check-list. The thing I always check out is at what point they recommend a couple should contract their florist. Most planning calendars suggest you book your florist 6-7 months before your wedding and I’ve seen sources that suggest 4 months is ample time to contract a designer–I’m going to have to disagree with this. I read a recent check-list in a national magazine that advised, “You needn’t nail down a florist as early as other vendors because they can serve multiple clients on one day.” This thinking is a bit out of touch since there are more and more floral designers who focus on custom wedding design and limit the number of bookings in order to better serve their clients. Style savvy couples are no doubt researching florists online and the wedding-focused designers clearly stand out whether they work from a storefront or a studio. If you know you like a particular designer inquire with them as early as possible. I get most of my inquiries anywhere from 15-8 months in advance so the “don’t worry, your florist will be waiting for your call” approach would not be my recommendation if you are planning to marry anytime from June-October. I am sure this is the case for many floral designers. I think perhaps it’s time to update the floral piece of the planning calendar to reflect the fact that when flowers are a priority for you design-wise you should act sooner rather than later. Whether you are planning a destination wedding via e-mail and phone consultations or hosting a wedding in your backyard once your venue is decided you can hire a florist that best suits your style, budget and location. Above is one if my favorite attendant’s bouquets. 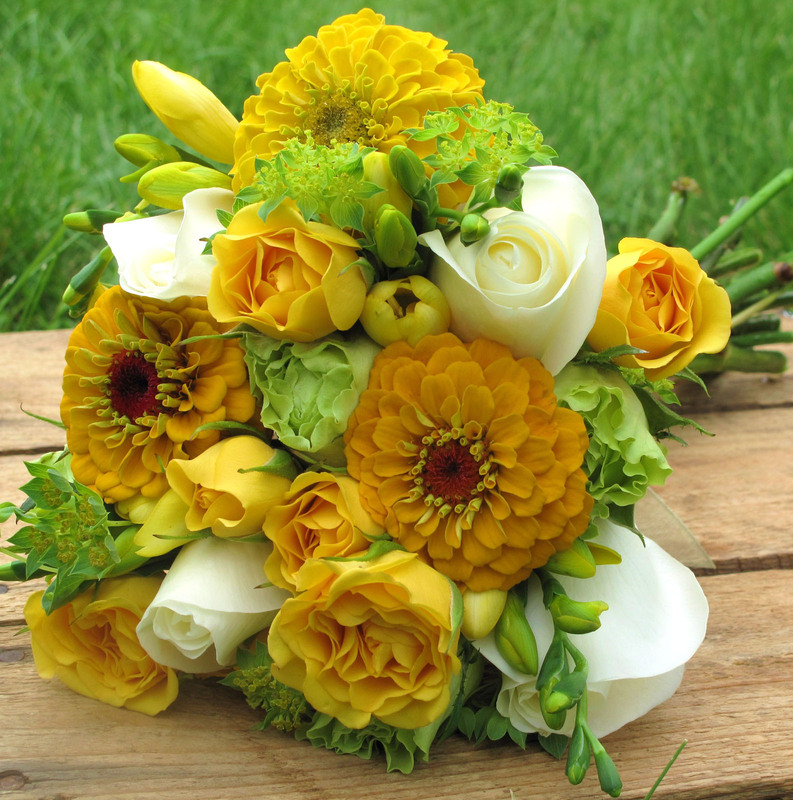 The citrus tones in the yellow zinnias, freesia, garden roses and bupleurum with lemon yellow spray roses is such a clean, fresh look.